WELL. My first draft of this post was WAY too long. So I changed it, and talked less. A revolutionary idea, I know. If you told my students that, they wouldn’t believe you. Anyway, this post is about our unit. I’m planning a mini-post later in the week about the other exciting units happening around me. I want to share resources but I also know I can’t go on forever, so red text means links if you’re interested in seeing exactly what we used! This is a unit that has already seen multiple iterations. For a few years, we read The Diary of Anne Frank (the screenplay), by Frances Goodrich and Albert Hackett and Night, by Elie Wiesel. Those texts were supplemented with discussions of historical background and the use of propaganda by both sides. However- confession time!- I was never happy with Night. The combination of difficult language and mature content made it all but inaccessible to everyone but my most gifted students, which led to disconnect and apathy about the whole thing- the opposite of what I was hoping for. Night is, of course, a wonderful book that everyone should read, and I don’t aim to keep my students from struggling, but I wanted them to have a more connected, personal, meaningful reading experience. 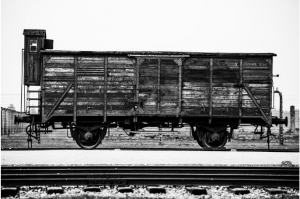 I struggled with ways to do that over the years, trying everything from ignoring it entirely (NOT what I would recommend) to using dystopian literature to make Holocaust connections, and finally settling on Holocaust historical fiction. But every year, at the end of the unit, students still had so many questions that we couldn’t possibly answer them all. 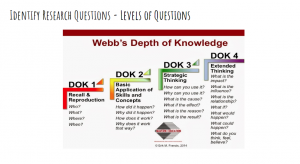 For that reason, THIS is the unit we chose to overhaul with Guided Inquiry. Immediately upon coming into class the first day, students were shown this quote. They were asked to brainstorm for five minutes about what that quote means, whether it’s true or not, and what it could mean for them, or for society. They shared their impressions with each other, and a few volunteered to share with the whole class. I then told them that this had been translated (albeit loosely) from Hitler’s Mein Kampf, and asked that they add to their original writing, telling me whether or not knowing who said this impacted their perspective and explaining their answer. 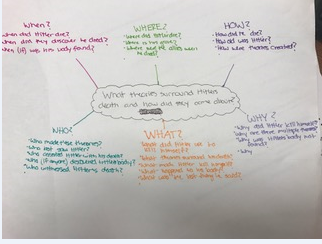 We also looked at Holocaust photos and students made observations about what they saw, then made inferences about what was happening, then shared their answers with each other and ultimately with the class. Last, we watched a video clip from The Sound of Music. Serendipitously, students had seen a stellar performance of it in the fall at Norman North High School, so they all recognized the song Edelweiss, and we relived intensity of the scene where Captain Von Trapp becomes too emotional to go on singing, so his family joins him, and then the whole audience does, even while the SS Guards are waiting to take him away. After listening, I asked if anyone knew what an Edelweiss was, and they were surprised to learn that it is a flower native to Austria. We watched a second time, and then discussed why they would all be singing and having such strong feelings about a flower. I was impressed with how insightful they were, talking about how the flower represents Austria, and singing along is a way for the whole audience to express their dissent. In some classes this spurred conversations about how important it is to express dissent and how we have many more options for doing that in the United States. I can only let those go on for so long, but I do love that they’re making real-world connections already. We hung out here for awhile. First, we read The Diary of Anne Frank in our literature books. Before reading, we watched the first half of the terrific documentary Anne Frank Remembered. I like watching part of this first because it gives some background information about each of the inhabitants of Anne’s secret annex, and there is footage of the actual annex as well. This helps students to have some context for what the families endured before going into hiding, as well as what they were dealing with in such a small space. As we read the play, students kept a list of questions they had in their comp books. The play ends abruptly, with the families being discovered by the Nazis. When we finish reading, we also watch the second half of Anne Frank Remembered, because the students always need closure on what became of Anne and the other inhabitants of the annex in the concentration camps. Next, my teammates Kasey McKinzie and Leah Esker and I had a carousel of immersion lessons. Since our ultimate plan was for each student to develop a question about World War II, we each chose a different aspect to discuss. We taught the same lesson for three days to our own class and to each other’s classes. 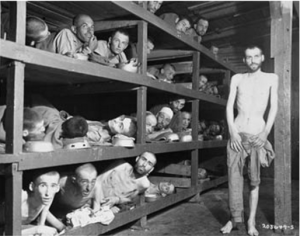 The topics were propaganda, concentration camps, and resistance efforts. Students took a note catcher to each class to keep track of information and to generate questions. The last step was for students to be fully immersed in a WWII historical fiction novel of their choosing. I’ve written several grants over the last few years (I’m SO thankful for our Norman Public Schools Foundation- they help us to great things for our kids), I ended up with fifteen different book choices for my students (if you read my blog last year, you know that I am positively RABID about student choice) with a variety of settings and protagonists. 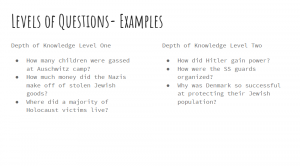 We wanted to students to read their novels, talk about them with each other, and learn about the Holocaust from multiple perspectives, generating questions the whole time. It wasn’t as neat and tidy as all that, but we did eventually get there. 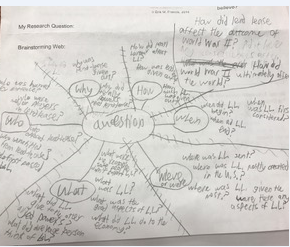 We dedicated almost two weeks of class time for reading, and they did keep a reading log that I checked everyday so I could monitor their progress, and they completed a reading guide to help me check for understanding and critical thinking, as well as to help facilitate their discussions. The next phases seemed to me to pass very quickly, especially in comparison with immerse. We spent three days in Explore, and I wish we had spent longer. But I was happy with what we did with that time. With the help of our librarian, we created a symbaloo filled with resources for our students to explore. As they did so, they kept track of what they may or may not want to come back to on an inquiry log we adapted. They were able to read articles and interviews, watch videos, and more. 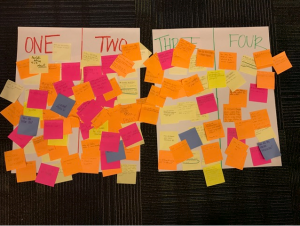 There are more post its on the One and Two poster, but the questions really did run the gamut, which I was pleased to see. This did require trial and error for some students. 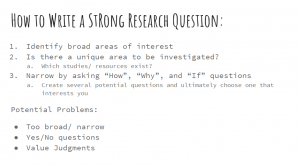 I heard quite a bit of…”Um, I don’t have any other questions to ask?” That was good, because it let me know when a student needed help either writing a higher level question OR if I needed to provided guidance that they attempt another one of their options. In what different ways did Nazi propaganda affect the opinions of German people? How did the medical experiments performed on some prisoners impact survivors mentally and physically? How did the U.S. program of Lend-Lease affect the outcome and aftermath of WWII? 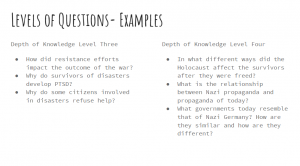 How did Nazi occupation of other countries affect those countries and their citizens? 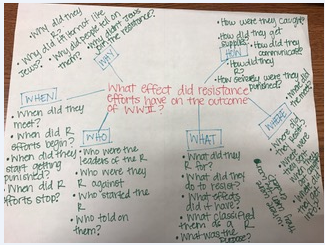 How did the actions of those involved in resistance efforts impact the outcome of the war? 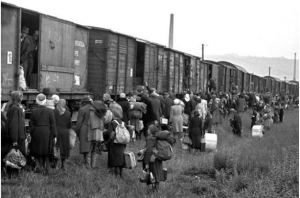 How were Jewish refugees treated similarly or differently to the way refugees are treated today? I remember writing last year that I loved Gather because of the switch that took place in the classroom- instead of me showing them cool stuff, suddenly THEY were the ones with the inside information. That definitely happened again this year, once we turned them loose. Before we did that, we knew we needed to talk about determining credible sources. The reasons for that extend far beyond an eighth grade research project- in the information age, it becomes more important every day for EVERYONE to be able to determine credibility and to know bias when they see it. So we like to start with a discussion of Wikipedia and how to use it as a starting point and not an ending point. We actually read an article on Wikipedia about how Wikipedia isn’t intended for academic use. We also watched this video on determining website credibility, which does have some tips but is most just HILARIOUS. We also have a great tutorial, that’s really more of a webquest. We have a handout and student find the answers. (Just like last year, I fully credit my best friend and all-around library mastermind Kelsey Barker with developing this part of the lesson when she worked at Whittier several years ago). I’ll admit, I was nervous about this. I think it’s incredibly important to talk about ISSUES with kids, but I think it’s just as important to keep partisanship out of it. They’re in eighth grade, and many of them haven’t developed their OWN opinions. I want everyone to feel welcomed and loved in my class, so when we talk about issues, I frame them in the way that they relate to the curriculum. So I really had my reservations about this, but I could NOT have been more pleased with the way my students handled it. I issued a disclaimer right away that I didn’t care for the use of the word Garbage, and I would like us to ignore that. 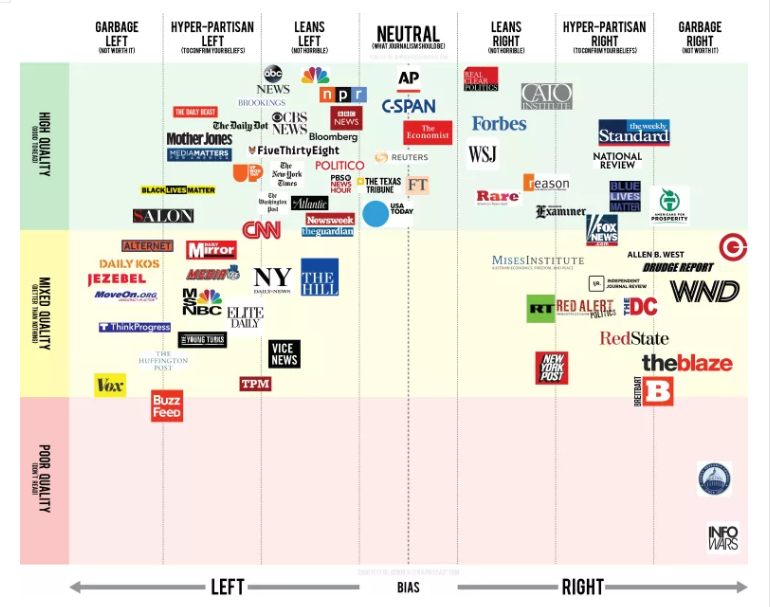 We used this to talk about recognizing bias in the media, and how just because something is biased doesn’t mean we shouldn’t read it, but that we should do so with the bias in mind. I really wanted my students to take two things away from this chart, and they found them both. The first is that The more neutral a source is, the higher quality it is. The next thing I did was have students point to major news outlets on the big screen, and we put little flags by them. When we were done, students could see that of the places people are most likely to get news, none of them fall into the neutral category. Even though I had reservations, I ended up being so proud of how mature and observant my classes were, and I think it was a really worthwhile discussion. THEN we turned them loose, armed with all this information, to find their own sources. This one was so hard for us to decide. Last year, we wrote an essay, so we were considering that option. When we taught the novels in isolation, students did a great creative project about perspective, but we couldn’t figure out a good way to marry that with the research they were doing. When we were trying to decide, I recall saying to my colleague Leah, “I’m not married to any product we’ve done before. I’m married to the PROCESS, and I think the product we choose should be a true reflection of that.” She ultimately had the terrific idea of having students create an annotated bibliography. I loved this idea because it allowed us to stay completed immersed in research the entire time- no one’s attention was diverted by the stress of trying to get a paper written or anything else. 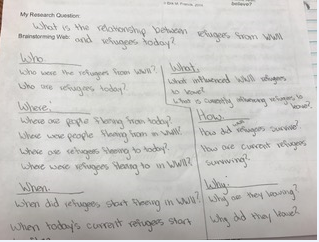 The entire unit, the focus truly was on the research students were doing and the sources they were finding. In their annotated bib, students had to summarize their source, provide two indications that it is a credible source, and explain how it helped them ultimately answer their question. Here is an example of a finished bibliography. Okay. Whew. I’ve done so much talking. I will link our activities for Share and Evaluate here. For share, once students had their thoughts on paper, we did an inside/outside circle, or wagon wheel, so that they got to hear from multiple people. I hope you enjoyed reading about our unit! I’m happy to answer any questions or give more information about everything. At the end of every unit, I can’t help but think about what I would have done differently, but I am ultimately happy with the decisions we made. I’ll be back tomorrow to share some other great things happening around my school. Thanks for reading! PreK and GI? You betcha! Leslie on Go For It! Trisha Hutcherson on Little Kids and GID?